Like all of the constellations, Gemini was named long ago, before electric yard lights, billboards, smog and the other trappings of modern civilization. The fainter stars that complete the constellations can no longer be seen by most city-dwellers. Light pollution has obliterated much of our view. Perhaps the Twins cross the sky hand-in-hand so not to lose sight of each other? The Twins’ heads are the nearly identical and relatively bright stars Castor and Pollux (the latter slightly brighter and closer). Saturn, now poised east of Gemini, is brighter still but fading fast. It is receding from Earth as we move around the Sun, but still shows its rings in a telescope or binoculars. 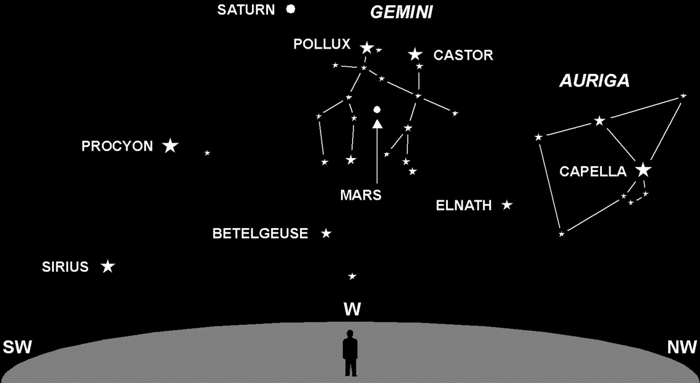 Mars lies between the Twins, and is noticeably fainter and redder than Castor or Pollux. After a great showing earlier this year, Mars is now just a small red dot in all but the most powerful amateur scopes.